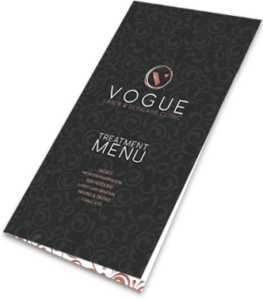 Let Vogue Laser and Skincare Clinic look after you and your beauty needs. Time to Escape for some 'ME' time? At Vogue Laser and Skincare Clinic it’s all about you – tailored treatments to suit your body, your schedule and your budget. Women throughout the Hills district of Sydney are searching for a secret weapon against ageing. They’re looking for someone who knows what it’s about and how to fight it. They want a haven from their daily life. Somewhere to kick off their shoes and leave their worries (and worry lines) behind. And while we’re there, it’s time to say goodbye to those pesky hairs that keep popping up. If you can throw in a lash lift, an eyebrow tint or wax at the same time, we know we’ve found our happy place. Let us listen to your concerns. Feel free to tell us about previous experiences – the good, the bad and the let’s not go there. While you’re having your pre-treatment consultation, tell us everything you can think of, so we can identify and avoid any contraindications. The more we know about you, the better we’re able to tailor your treatments to suit your needs. We pride ourselves on delivering a service that exceeds your expectations when it comes to our professionalism – be it care, hygiene or confidentiality. Beauty may be in the eye of the beholder, but it doesn’t hurt to have a helping hand. The treatment I just had was Skin Needling. I loved it. Although I was very red, the redness has now subsided and my skin feels great. l’ll be having more treatments. Kim is fabulous, she is very professional and all her attention is focused on you, the client. I look forward to more treatments. Copyright 2017 VOGUE LASER & SKINCARE CLINIC All Rights Reserved.